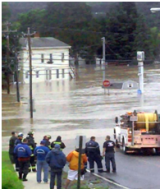 One year later, the community gathered to commemorate the anniversary of the 2011 flood at an event called Country Strong on August 26 at The Schoharie County Fairgrounds in Cobleskill. Aug. 16, 2012 - PRLog -- Albany, NY - Mythical floods have graced literature since the beginning of time but the flooding from last year’s hurricane and tropical storm-- Irene and Lee – was no myth for the thousands who were impacted by the flood – many of them clients of the Schoharie County Office for the Aging. One year later, the community gathered to commemorate the anniversary of the flood on August 26 from 2 p.m. to 9 p.m. at The Schoharie County Fairgrounds in Cobleskill. The event, "Country Strong" was an opportunity to celebrate how far they had come, and hopefully raise awareness of continued need to get people displaced by the flood back into their homes. Case management and disaster relief continue to be priorities for the Schoharie County Office for the Aging, according to Nancy Dingee, Director of the Schoharie Office for the Aging. Currently only 20 percent of those affected are back in their homes. Nancy Dingee joined the Schoharie County Office for the Aging two years ago. “We welcome Nancy and the other 20-plus directors appointed in the last couple of years. We are featuring these individuals in a series of articles to introduce them to the aging services network and learn a bit about them and the agencies they lead,” said Laura Cameron, Executive Director of the NYS Association of Area Agencies on Aging, an umbrella organization for aging organizations. Dingee was only one year on the job when Hurricane Irene and Tropical Storm Lee caused about $73 million worth of damage in Schoharie County. Luckily, the office had recently moved to a web-based database when the flood hit, allowing Dingee and a colleague to access it from their homes. Even before they were allowed to come back to work, they were on the phone and on the database identifying seniors who were vulnerable to the flood and trying to determine their location and well being. Initial contacts with the seniors came from their home-delivered meals list. Schoharie County has been very supportive of that program so it’s a comprehensive list of the frailest seniors in the county. Dozens of homes were washed away and thousand impacted by the flood. To this day many of the seniors are living with family which is very, very stressful, Dingee said. The goal right now is to help them get back into their homes or find affordable housing. And there are only two fully subsidized senior housing complexes in the area. Other housing costs whatever normal rent is and in Schoharie that’s $600 to $700 a month. “It’s hard for seniors to afford that when they’re getting $800 maybe $900 a month in social security,” Dingee said. Dingee represents the senior population as a member of the he Schoharie Area Long-Term Recovery Group Board of Directors. As a county, they’re looking at creating a Continuance of Operations Plan, which is not what Dingee thought she would be doing at this point. “I thought we would be doing home care related work,” she said. That will come, though. The challenge right now is to help the seniors get back on their feet without spending down their savings, assuming they have some. Dingee doesn’t know the extent to which Medicaid Redesign will impact the population she works with. They’re Medicare recipients who will have to pay for home care when the time comes. They’ll need any savings they have for that and at $25 to $30 an hour it will go fast. But there is some good news: The Medicaid Redesign Team (MRT) waiver amendment recently submitted by New York State to the federal government includes funding needed to support the expansion and enhancement of New York’s Aging and Disability Resource (ADRC) also known as NY Connects. Click on http://www2.schohariecounty-ny.gov/NYConnectsWebPage/ for Schoharie's NY Connects page. If the waiver is approved, the additional resources for NY Connects will expand the ability of the Schoharie County Office for the Aging, and those throughout the state, to assist individuals of all ages seeking long term care services and supports. Sunday’s event was organized by Schoharie Area Long Term (SALT). A press conference at 3 p.m. will kick off the event. The event will highlight the fact that there is still a lot to be done and will feature entertainment and crafts vendors and a movie. For more information, go to http://www.saltrecovery.org.